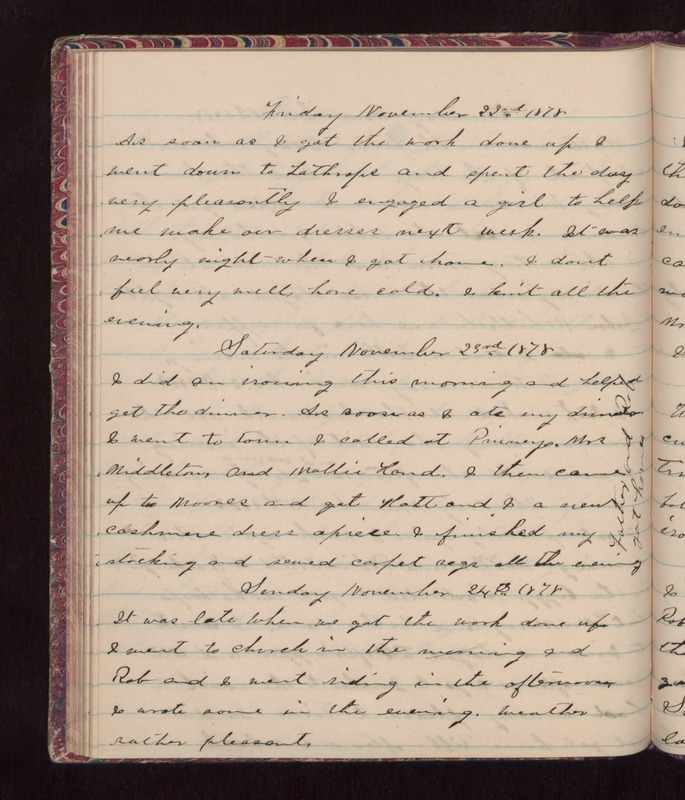 Friday November 22nd 1878 As soon as I got the work done up I went down to Lathrops and spent the day very pleasantly. I engaged a girl to help me make our dresses next week. It was nearly night when I got home. I dont feel very well, have cold. I knit all the evening. Saturday November 23rd 1878 I did an ironing this morning and helped get the dinner. As soon as I ate my dinner I went to town. I called at Prinneys. Mrs Middleton and Mollie Hand. I then came up to Moores and got Hatt and I a new cashmere dress apiece. I finished my stocking and sewed carpet rags all the evening. Father and Rob got [horses?]. Sunday November 24th 1878 It was late when we got the work done up. I went to church in the morning and Rob and I went riding in the afternoon. I wrote some in the evening. Weather rather pleasant.